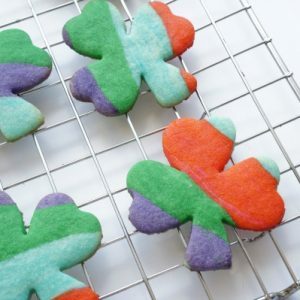 Bake up a batch of shamrock rainbow sugar cookies. How fun are these crisp sugar cookies - perfect for spring. In a stand mixer, blend together butter and sugar until creamy. Beat in egg and vanilla, until smooth. In a small bowl, whisk together flour, baking powder and salt. In 3 batches, add dry ingredients to wet. The dough will come together and pull from the sides of the mixer. Transfer the dough to a parchment paper lined surface and form into a big ball. Divide the dough into 4 portions. Colour each portion. We used green, blue, red/yellow and violet. To colour the dough, add a dab of food colouring to a divot in the centre of the dough. Knead the colour into the dough until you reach the colour you like. We went for darker, more intense colours. Now, divide each portion of coloured dough into 4 portions. Roll each portion into a long “snake” of dough. Line up the rolls of dough on a sheet of parchment paper. Use your hands to press the rolls into each other. Place another sheet of parchment paper on top of the dough and use a rolling pin to roll the dough to 1/4 inch thickness. Because you’ve been working with the dough and warming it up with your hands, it is important to place the sheet of dough in the fridge to cool before cutting out the cookies. This will help the cookies keep their shape. I placed the sheet of dough on a baking sheet and placed it inside the fridge. Let the dough chill for at least an hour. After the dough has chilled and is firm, it is time to cut out those shamrocks! Cut out your cookies as close together as possible. You can roll up the scrap dough, but the rainbows will look more tie-dyed than as crisp as the original cookies. Anyhow, cut out those shamrocks. I used a small heart cookie cutter to cut up any spaces where I couldn’t fit a shamrock. Place the cookies on a parchment paper lined baking sheet. Bake the cookies in a 375°F oven for 8-10 minutes – until the edges are lightly golden. Once the cookies are baked, let them cool on the baking sheet for a few minutes before transferring them to a cooling rack.